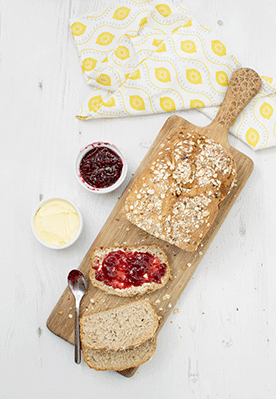 Slighty sweet with nuts, seeds and raisins, this bread is perfect with jam or butter. 1. Shake muesli bag to have a good mix of oats, nuts, seeds and fruits. 2. Combine flours, muesli, yeast and salt into a large bowl. Make a well in the middle. Add butter, honey, water and lemon juice. Mix together by hand or dough mixer attachment until it all comes together into a ball. 3. If you are using a mixer dough hook, carry on mixing for 10 minutes at medium speed. If working by hand, tip the dough onto a floured surface and knead for at least 10 minutes until smooth and elastic. 4. Oil a clean bowl. Place the dough in it, cover with cling film. Leave to rise for 1 to 1.5 hours in a warm place until it doubles in size. 5. Heat oven to 220°C/fan 200°C/gas 7. Place a large baking tray at the bottom of the oven. 6. Place the dough onto a floured surface and push the air out by pressing all over with your fingertips. Shape the dough into an oval ball. Place in a 900g oiled loaf tin. Wet the top with water and coat with muesli (remove fruits as they would burn in the oven). Cover loaf tin with a tea towel and leave to prove for 30 minutes. 7. Once you are ready to bake the bread, place the loaf in the oven and add 250ml of water in the baking tray at the bottom of the oven to create steam. Bake the bread for 15 minutes at 220°C/fan 200°C/gas 7. 8. Reduce heat to 190°C/fan 170°C/gas 5 and continue to bake for 30 minutes. 9. Once done, leave the bread to cool a little then carefully remove it from the loaf tin and leave to cool completely on a wire rack.